If you’re a fan of both Alex Ross and Firestorm, then you’ve probably asked yourself at some point, “Does Alex Ross Hate Firestorm?” I gotta tell ya, some days it feels that way. To be perfectly clear, this is not a bashing of Alex Ross. I love, LOVE, L-O-V-E his artwork and would be thrilled to see Firestorm fully-rendered by such a masterful artist! It’s just disappointing we haven’t had that opportunity. Alex Ross began his professional comic book career 25 years ago. In that quarter century he’s rendered the Justice League dozens and dozens of times; and yet he’s only rendered Firestorm once. Just once. And to be specific, that one time he was painting over George Perez’s pencils, so Ross didn’t have a choice about which characters to render. Alex Ross has demonstrated his love of the Satellite Era Justice League on numerous occasions, yet Firestorm has never crept into any of those renderings. As Firestorm was the final member of the Satellite Era League, you’d think he’d be included. Heck, Ross often includes other heroes from DC’s pantheon that weren’t even members of the Satellite League (i.e. Plastic Man, Captain Marvel, & Metamorpho). As a fan of Firestorm (a.k.a. Match-head), you can’t help but feel disappointed. 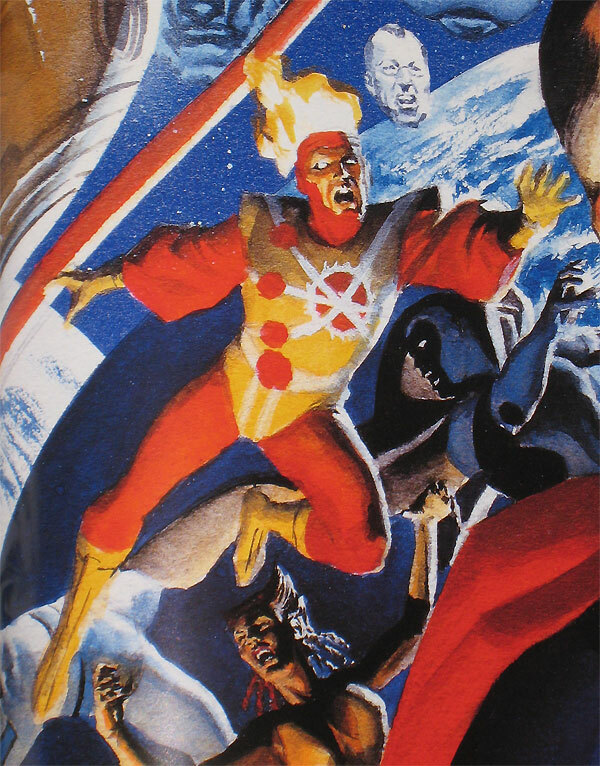 I’ve been researching the lack of Firestorm rendered by Alex Ross for years. While I don’t have a concrete answer, I have some circumstantial evidence worth considering. 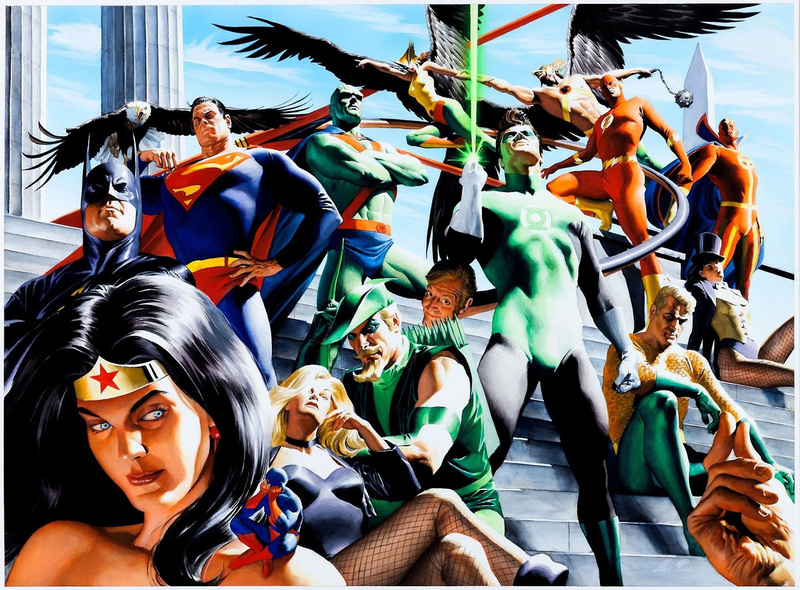 Exhibit A: We know Alex Ross is interested in the Silver Age versions of DC’s heroes. Below you’ll find an excerpt from an interview with Ross conducted back in 2004 by The AV Club of The Onion. Click here to read the entire interview. The Onion: Looking at your work, Bruce Timm’s animated series, Alan Moore’s America’s Best Comics line, and, to a certain extent, Grant Morrison’s run on JLA, there seem to have been efforts to return to a Silver Age approach. Even Superman’s dog Krypto is back. 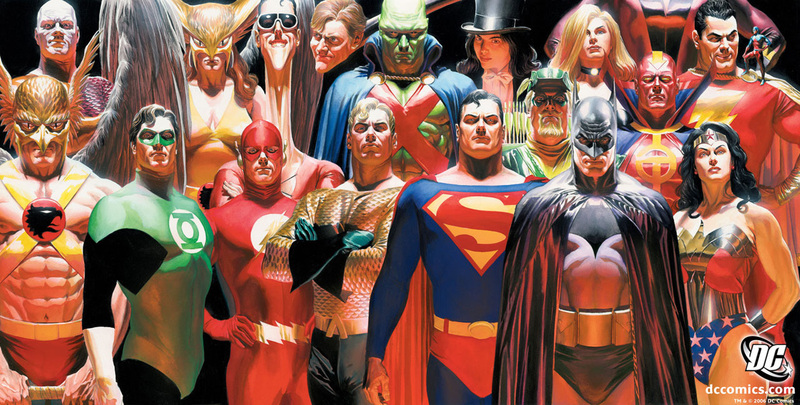 Alex Ross: What you have is a bunch of 40-year-olds and thirtysomethings like myself. We grew up with this stuff thinking of it a certain way, and we’re rejecting what was kind of knocked around on us the last few years. Basically, what still is going on in modern continuity, especially at DC Comics, is a rejection of everything they did in the 1990s to compete with the then-hip-and-happening changes coming from the more tumultuous time of what Marvel and then Image comics did. We’re sort of in a repairing stage. Those of us who are kind of these Silver Age purists who think you don’t need to fix what isn’t broken, we’re getting our way because more of us are in control at the moment. 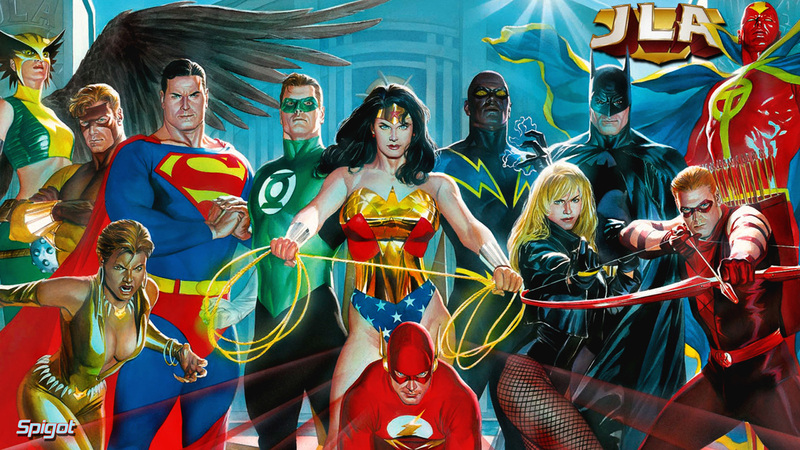 Exhibit B: We know Alex Ross and Paul Dini made a conscious decision about which members of the JLA to feature in their gorgeous treasury-sized, JLA: Secret Origins and JLA: Liberty and Justice. 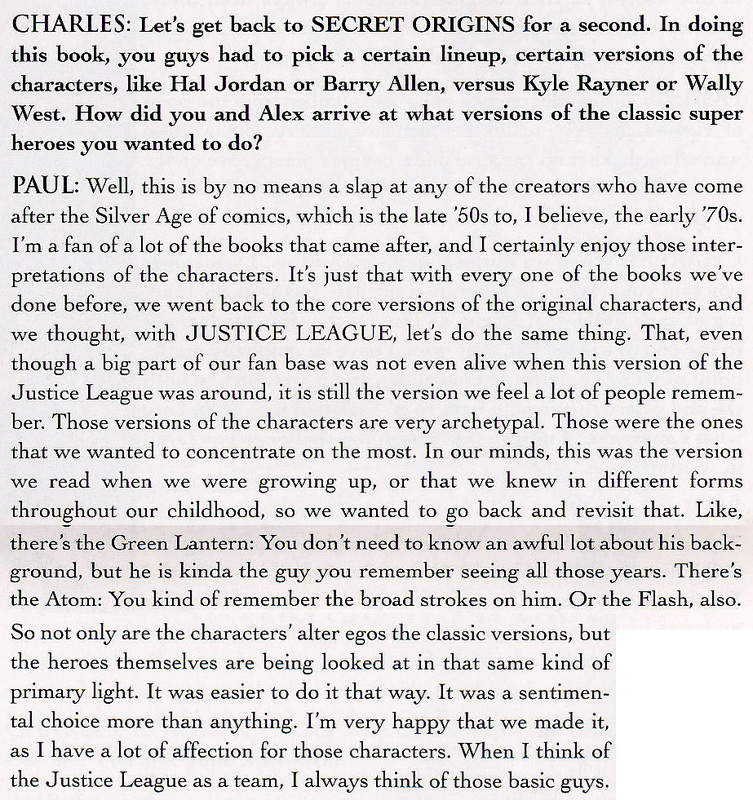 Below is an excerpt from an interview with Paul Dini printed in the back of JLA: Secret Origins. 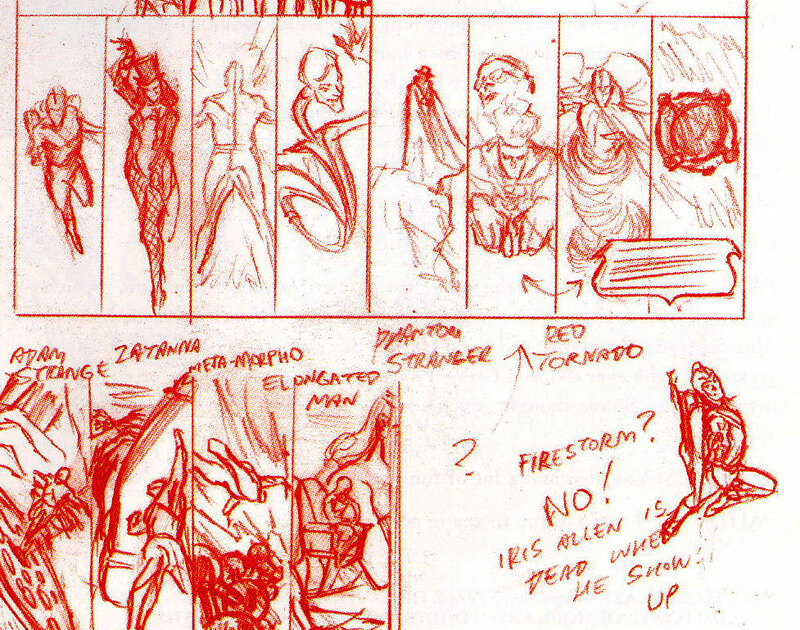 Exhibit C: From JLA: Secret Origins, here is a preliminary sketch for a series of panels including Firestorm, followed by the final version of those panels without Firestorm. Notice the JLA Satellite panel width is expanded to accommodate the missing Firestorm panel. Most importantly, notice the Firestorm commentary on the bottom right of the sketch. There it is Match-heads, the strongest evidence for Alex Ross’s aversion to Firestorm. We don’t know if that note was written by Alex Ross or Paul Dini, but regardless it played a role in their decision to exclude Firestorm from JLA: Secret Origins and JLA: Liberty and Justice. I believe I understand where they are coming from with that decision. Some people consider the death of Iris Allen to be the beginning of darker storytelling for the DC heroes. It occurred in the middle of the Bronze Age, as comics marched towards the “Modern Age”. Or perhaps Ross and Dini prefer the Flash before he suffered the tragedy of losing his wife. If Ross doesn’t want to stray into the “darker” era of DC Comics, then that’s a reasonable cut-off point. Putting this on a timeline, Firestorm was created prior to the death of Iris Allen, but he hadn’t joined the JLA yet. In case you are wondering, Zatanna was the second-to-last member added to the Satellite Era JLA. Since Ross typically includes Zatanna, I checked and sure enough she joined the JLA in Justice League of America #161 (cover dated December 1978), seven months before the death of Iris Allen. Though if you want to get nit-picky, Zatanna wasn’t wearing her classic stage magician’s costume while she was with the JLA during this era. I imagine Ross overlooks that fact in favor of Zatanna’s most iconic costume. Exhibit D: We can accept that Alex Ross may only want to draw the Satellite Era JLA as they appeared prior to the death of Iris Allen. However, Ross has rendered a few modern day JLA pieces, each lacking a certain Nuclear Man. Below you’ll find team shots including latter-day JLA additions, such as: Blue Beetle, Captain Atom, Mister Miracle, Big Barda, Orion, Lightray, John Stewart, Hawkgirl, Geo-Force, Vixen, Black Lightning, and Red Arrow. Was the exclusion of Firestorm intentional or simply a case of circumstance? Summary of Findings: Evidence indicates Alex Ross prefers to render the Satellite Era Justice League as they appeared prior to the death of Iris West; therefore, no Firestorm. The lack of Firestorm’s inclusion in Ross’s modern day JLA work is inconclusive. Final Verdict: Does Alex Ross hate Firestorm? I don’t think there is enough evidence to confirm or deny this statement. However, 25 years in the comics industry with a reputation for rendering the JLA and he’s only drawn Firestorm once? It certainly seems to indicate a lack of interest in the character. With all this said, I still love Alex Ross’s work! To keep up with Alex, follow him on Facebook, Twitter, Instagram, and his website! I’m not the only one wondering about Alex Ross’s aversion to Firestorm. Check out Dale Bagwell’s blog post on this very concern! Support Firestorm (and Alex Ross)! Fan the Flame! Posted in: Comic books, Firestorm #01: Original (Ronnie/Martin), Justice League of America, Sketch/Art. Does Ross do commissions? I’m sure it would cost a thousand dollars, but it may be the only way you’ll ever get the Alex Ross painted treatment of Firestorm. That last picture with Vixen, Geo-Force, and Red Arrow was the then-current JLA team, so Ross can’t be faulted for not including Firestorm there. That being said, if he is placing his work firmly in the years before Iris died, it absolutely makes sense to not include Firestorm. Besides, we have never seen the Detroit era JLA, either, you know. Ross’ JLA is from the Silver/Bronze Age, and Firestorm is just not part of that group….but tuxedo Zatanna is. I believe that there has been enough evidence over the years to prove that, while he’s an amazing talent, he is a huge, hypocritical DB when it comes to Firestorm. “My JLA exists before Iris dies.” Whatever helps him sleep at night. He just doesn’t like to draw the character. He will always have that black mark on his permanent record in my office. I mean he seems to like taking pictures of models and then drawing them. I could see that he has trouble finding anyone to sign up to set their heads on fire for the sake of a match-head pic. I read somewhere that his not doing Kyle as GL, was due to not being able to draw the mask to the level of “real” the rest of the peice had… (the article was Emailed to me by H.E.A.T as evidence I was wrong for likeing Kyle). IF that is true it may be that there is something to Nate’s “Fire hair and puffy sleeves” are hard theory. In the late 1990s, when I was a Chicago Comics customer, Alex Ross came in and a friend of mine, who knew him, mentioned how I’d just gotten the Crisis cover as a poster and was a big Firestorm fan. AR didn’t exactly negatively respond, but he sure didn’t have a conversation with me re: flame-head…. I swear I read a quote from Ross somewhere, where he said he hated Firestorm’s costume. I could be wrong though. As much as I love Ross’ work, it does irk me that he always shoehorns Captain Marvel and Plastic Man in to the JLA. Metamorpho was a reserve or honorary member, I think, so I can see that. The death of Iris was certainly a pivotal moment but I still feel like the satellite-Era JLA deserves to be considered silver age. Elongated Man and Firestorm brought a lot of humour to what we’re til then personality-indistinguishable boy scouts. The stories were still adventure-based, not to deep and more than ever, lots of fun. I always found Alex Ross to be a weird Eart-X place. Fantastic art UT every character looked to be in his 40s. I’m not sure teenage Ronnie as Firestorm is really his style. “It was a heartbreaking period for me as a kid, because I first started getting my DC comics around that time, when I was six or seven. I got one issue of Adventure Comics, where Aquaman has this cute little family – his sidekick, his wife, his son who’s dressed like him. At that age, I thought that was the cutest little thing, and then the next issue I get; Black Manta has killed the kid. I was shocked – I mean – you couldn’t just do that, could you? This guy was on television – you don’t kill the families of people who are on television! I know some people are getting up in arms about DC killing heroes and characters now, but they were making commitments even back then that they would never walk back from. I’m going to say “Yes, he does,” and for proof, I point you to Kingdom Come. Not only does Firestorm not appear, even though there are re-imagined versions of lots of far more obscure characters, but look at the Ray. He is always flying around, doing things that don’t match any version of the character, but are a basic part of Ronnie’s power set. Try it yourself, reread the book, and replace the Ray with Firestorm. You’ll see it makes much more sense, and is the definitive proof that ALEX ROSS HATES FIRESTORM! Joe X, in the graphic novel collection I have, it shows the character spreads that were covers of the issues. In 1 of them (I’ll have to double check my copy), it does make mention of 1 “new” generation hero that has taken up the mantle of firestorm as the earth’s fire elemental. CBR recently ran an article about Ross’ dislike of Kyle Rayner (and other post-Bronze Age DC characters). It includes a pic of Kyle Rayner, proving if nothing else that he has painted the guy at least once. And hey, at least you have one Firestorm image by Ross. He’s never painted Booster Gold. Wizard: What character do you hate working on the most? I have searched all of the online Alex Ross interviews I could find, as well as my collection of printed Alex Ross articles and interviews and did not find any reference to the Firestorm costume in any of them. The quote I am recalling was comparing the costume to that of a “flamboyant flamenco dancer” or something to that effect. An internet search for “Firestorm” and “flamenco” turns up a number of message boards where comic fans are attributing the flamenco comment to either Alex Ross or Grant Morrisson, so I do not want to attribute this quote to Ross until I can find the actual interview in which he said that. Does anyone else recall the article I am thinking of? ^That rings a bell, Xum. I think that was the first time I myself associated the classic Firestorm costume to a flamenco dancer. I know I read that somewhere! Xum, thanks for the link to the TFW2005 site (always happy to see more Transformers fans connected to this fandom!). I’m finding it more than a bit ironic that Ross seems to connect the introduction of Firestorm (arguably one of the most light-hearted and upbeat characters in the DC canon) with the “dark period” when all of his beloved Silver Age characters were being killed off.